This magazine's cover story last week detailed how the number of self-identified Christians is falling and how the religious right has failed as a political movement. Yet you say those who bet against the strength of American Christianity have invariably been proved wrong. One of the things the article argued in NEWSWEEK was that religion would retreat a bit in American politics. We're not so sure about that, for two reasons. [First] you have perhaps an even bigger split than before—between a bigger number of people who are not keen on religion, and then a larger core of people who are. The other issue is that religion has stopped being just a Republican issue. The religious right has run into real problems. But the sort of religiosity that Obama typified—there's a way in which those religious elements could spread rather than go down. You write that the developments many thought would destroy religion—such as democracy and markets—have made religion stronger. Might our economic crisis change that? It could. But globalization has two kinds of effects in terms of encouraging people to be religious. In the Islamic world and in the poorer bits of India, or Arkansas, religion is a shield against the modern world. [Also,] there are a lot of people for whom religion is a way to get ahead. If you go around the megachurches you can discover self-help books on how to run your business better. The people who the old-style secularists expected not to be religious are actually religious in very large numbers. In arguing that “religion’s power” has “continued to increase,” they contradict considerable evidence to the contrary. (The 2008 American Religious Identification Survey, released this month, found that “the U.S. population continues to show signs of becoming less religious, with one out of every five Americans failing to indicate a religious identity in 2008.”) In arguing that modernity and religion are compatible, Mr. Wooldridge and Mr. Micklethwait play down that Osama bin Laden and other radical jihadis embrace highly puritanical, backward-looking forms of Islam that stand in direct opposition to much of modernity. (The authors also fail to grapple with the anti-progressive impulses of Christian and Jewish fundamentalism.) And in arguing that religion is increasingly a matter of choice, they ignore the plight of people (like women under Taliban rule) who are forced to live by strict religious codes they themselves may not believe in. And the Golgotha Fun Park (talk about oxymorons!) 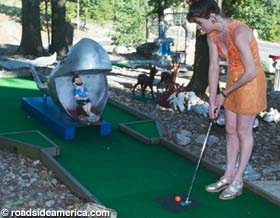 in Kentucky features a Bible-theme miniature golf course starting with the Creation at the first hole and ending with the Resurrection at the 18th. Yeaay! So is one supposed to celebrate or mourn if you go under-par on the hole with Crucifixion? On a sad note, it seems that Golgotha Fun Park is now closed (nooooo! ).